Goals. I’ve taken the leap, but what’s next? Business trip to Chicago, 2010. I stumbled upon art licensing. By the age of 24, still very young in the design world, I was the Art Director for a product manufacturing company that made napkins. About a year into my job, the company wanted to start an everyday line of napkins for things like birthdays, holidays, and girly get togethers. I had lots of ideas for designs to start out this new line, but the company decided to license a collection of new designs from an outside artist. That was the first time I heard of “licensing” art and paying someone for it. I immediately spent all my time looking up everything I possibly could about this “art licensing” and finding out: who does it? how they do it? what it’s like? how does someone get into that field? are their artists I like out there? are there things I’ve seen or own that have been licensed? etc. I was enamored with the idea that my art could be put on a multitude of products, my name would be on those products AND of course I would get paid for it! Something clicked in my mind, this was what I had been looking for. So we developed the new line. 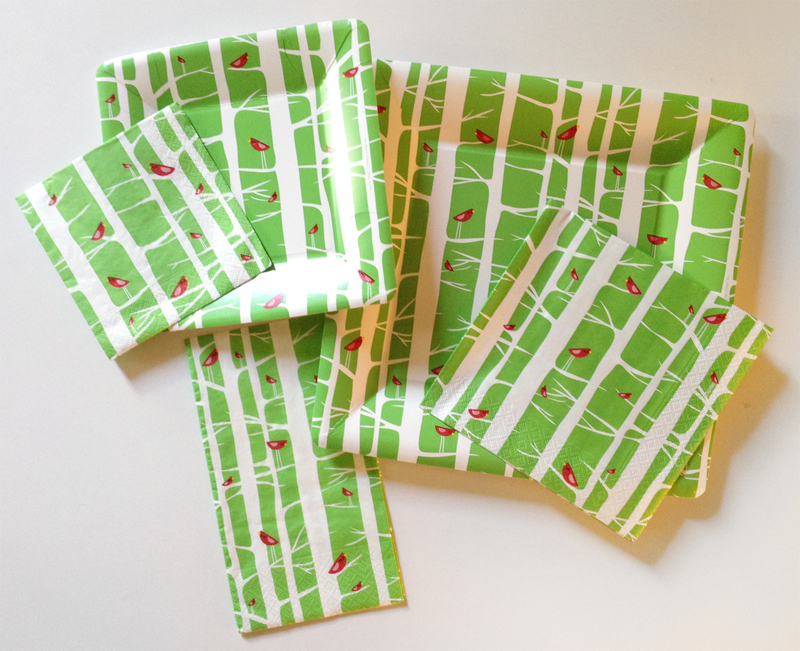 I stood by quietly, my brain swirling with ideas that I thought my friends and I would surely buy… I would draw on blank sample napkins all day, every day. And lucky me, at a certain point, it was time to update our line and the company decided I had some good ideas and we would use them! I was so excited! MY name would appear on a product, it was something I’d always wanted. (This is actually where I learned my first lesson in art licensing the hard way. Sign a contract first or you’ll get screwed. More on that subject some other time.) 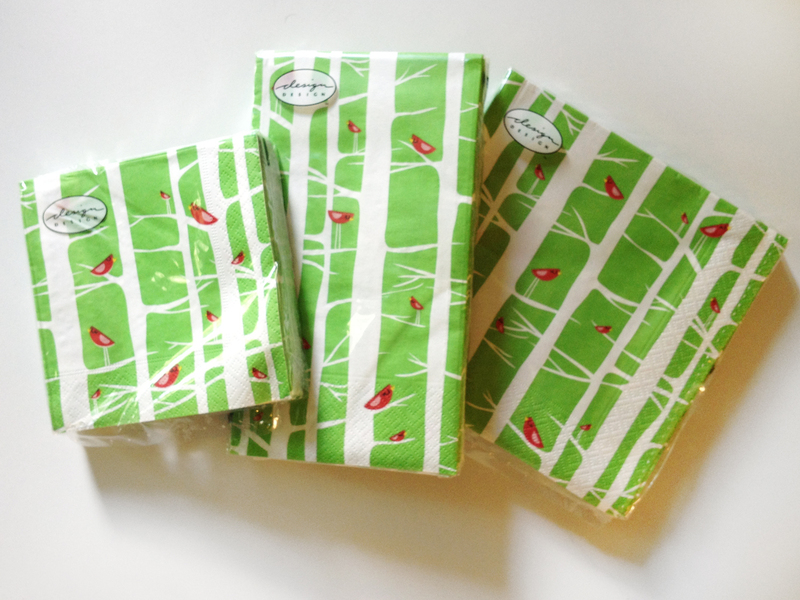 I created a bunch of ©Lezlee Elliott napkins that were fantastic!!!! WHAT!?!? Everybody loved them, and over the 6 months we noticed that my designs consistently made an appearance in the top selling designs for each month. This was great news! It means I had solid proof that my ideas were likable and people PAID FOR them! This was a whole new world for me. Eventually, the company gained lots of interest and everything seemed like it was moving in this amazing direction, when suddenly we had interest from a much bigger company to BUY us. It was an opportunity to work with a major manufacturer on a much larger scale, it was like our dreams for this company were coming true! Throughout this process of proposals and numbers my coworkers and I, which Amy happened to be one of, came to the realization that this purchase may not actually happen and we needed a Plan B like asap. That’s when I decided art licensing might be next for me. This is when the Chili’s meeting happened and I began developing a small portfolio. Jump to the end already, the company did not get purchased and corporate thought it was a good decision to let me go. to conserve money??? The job market was in a major recession, I was now almost 26, and my choice was either find another job or make art licensing a reality. I made the leap. Well… I guess I was pushed, but I decided now was as good a time as ever. She’s right. Damnit. I’d made an initial leap, and was content just where I’d landed. I was achieving the goals I had set for myself 4 years ago… and had not one single thought past that. I made the leap most people don’t even attempt to make and that was enough for me. But was it? Most people I know, and myself, have big dreams, but at what point do you define them as actual steps to take towards achieving that dream? Organizing what has to happen in which order and with what information to take the next step. It’s a difficult thing to do if you’ve never tried. And at this point, I was confronted with a question that I was not prepared to answer. I’ve taken one leap already, and it’s been amazing. Soon it’ll be time to take another one, and I’ll still be just as nervous and terrified as the first one, but I know it’ll be worth it. And after that leap? I know what comes next. This post is dedicated to my two best friends, Amy and Liz. Make it Work. every day. 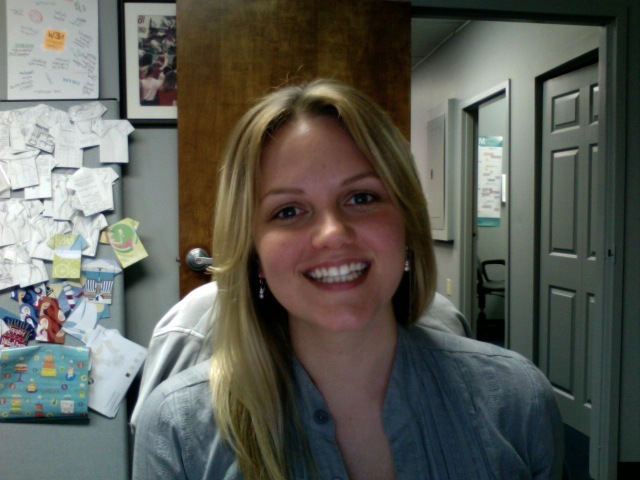 This week I celebrate 4 YEARS of being in business for myself! Starting out on this new adventure, which was literally sitting down in a Chili’s with two friends (Amy & Brooke) and going through ideas and thoughts on what to develop as an initial portfolio, I gave myself 5 years. In 5 years if I have gotten no where, no interest, and not moved forward, then I know I gave it my best shot. I would feel confident that it would be time to find a new direction. I could go on and on about how wonderful everyone around me has been… trust me. But this post is more about what I’ve learned about HOW to be in business for myself for the last four years. I am by NO MEANS an authority on how to run a business and as it grows the way I run it will evolve, but I know what I’m doing at this moment, works for me. People will say, “oh working for yourself that must be SO AWESOME I wish I could work for myself,” and I think… you have no idea how hard it is. Some times, I will actually take a second to explain that I have a certain approach to each day and find that people are surprised and impressed! They think it’s all pajamas and sitting in bed all day… uhhhhh no. So to elaborate on that, I thought I’d share with you just a few strong suggestions little things I do, that don’t cost a lot, to keep this business moving forward every day. 1. A dress code. No pajamas here. Ever. You can’t get ANYTHING done when you’re in pajamas, or laying in bed. Trust me, I tried for like the first week of being in business… I got nothing done, except catching up on Zzzz’s and TV. People are often surprised to find out that I get up and get dressed, but it’s something I’m proud of. This is a business, I treat it like one. Also, just as in most businesses, I have casual Fridays. I have one outfit I wear at the end of every week, and my husband refers to it as my “Friday outfit.” I look forward to that comfy gray shirt and jeans, it means I made it through another week and I can relax. 2. Have an agenda. It’s important to have Monday morning meetings at big businesses, to go over what needs to happen for the week, where everyone stands on current projects, and any new projects for the upcoming week/month. So, I have a “morning meeting” every day. I have a notebook (one of my lezleelliott notebooks, thank you) that I write in every day. Each day, on a new page, I write out my list of projects, “to-do’s,” and notes. I use my pink pen to check them off as the day goes on! I’m one of those people that jumps around the room enjoys checking things off lists. This helps me stay on task. The hardest thing about working from home (for me) is that daily chores/to-do’s for the house get muddled into my work day sometimes. I know the dishes need to be done, or the laundry is overflowing, and my brain is telling me that I should just take care of it, real quick, it’ll only take a minute. Well… that minute turned into sixty and now I’m hungry and it’s almost lunch time, and once I eat and get started at my desk the day is already half over. So in order to get past that, I check-in with myself every morning at my desk, make my list and decide what gets tackled first. 3. Always look at the big picture. I not only go through each day deciding on what needs to be done for that day, but what needs to be done for the year. I keep a yearly calendar right next to my desk so that I am required to look at it every day. I also cross off each day so I have a visual of how much of the year is gone, and how much I still have. This is SO important for me. In order to be prepared for each new year with new collections and presentations I have to start all the way back in June/July, and vice versa to be ready for June I have to start in January! Daily needs and assignments make the days go by quick, and not realizing where you are in the overall scheme of what needs to be done for the year can be a death sentence! Once, I had made it all the way to November and realized I hadn’t worked on ANYTHING new for January. That meant multidays for about a month, aka staying up for 36hrs. I’ll NEVER do that again, I immediately invested in dry-erase markers and a large calendar. 4. Stay organized. Part of utilizing a calendar and agenda is for the purpose of staying organized, but in addition to that, I try to keep the desk clean to keep my thoughts focused on my tasks at hand. I admit to being OCD… to a certain extent. I don’t require my tooth brush to be facing in a certain direction, but I have figured out that I cannot get ANY work done if my desk is a mess. It’s like my thoughts bounce around from one subject to another as my eyes bounce around my desk when its covered in paper or too much stuff. 5. Organize your work. This is something I did from day one. I have a filing system for everything I work on. I decided that if I ever had to hire someone to come and work for me, that they would need to know how to access files – just because I know where everything is, does not mean everyone will even though they should. I love to organize my work just as much as I love to make lists. I have folders for everything you could think of. COLL = Collections, where all new and existing design collections reside. They are also further organized into Illustrations vs. Surface Design, and I’ve provided myself a PDF for immediate reference into every collection created. CORP = Corporate, any documents or corporate related files. Contracts, logos, tax information… you get the gist. 6. Love your workspace. Last year when I got married and moved into my husband’s townhome he graciously gave me the basement to use as an office! Yay! So earlier this year, I decided to do something that would define this room as a separate space from the house by making it feel more like an office. For me it was as simple as adding a “wall” of bookshelves. Just a few cheap ones from Target… but it really made a difference. It was functional in that my office closet was getting jammed with samples and I needed to store them somewhere, plus I wanted to see some of the great things I had worked on. (It reminds me that I’ve come a long way in 4 years, and now I get to show it off!) Also, I had alot of books and “stuff” that were being kept in the closet and the room just felt a little empty and lacking. I needed a décor element in the room to feel authentic, like I’m walking into the office of lezleelliott every day. So this was my solution! I use a crystal bowl that we were given by a very dear friend, Sara, for my nail polish/lotion. She and I have talked extensively about people who never use those really nice things like your wedding china, or crystal pieces that they receive at the time of their wedding. They get put in a closet and only pulled out on very special occasions. 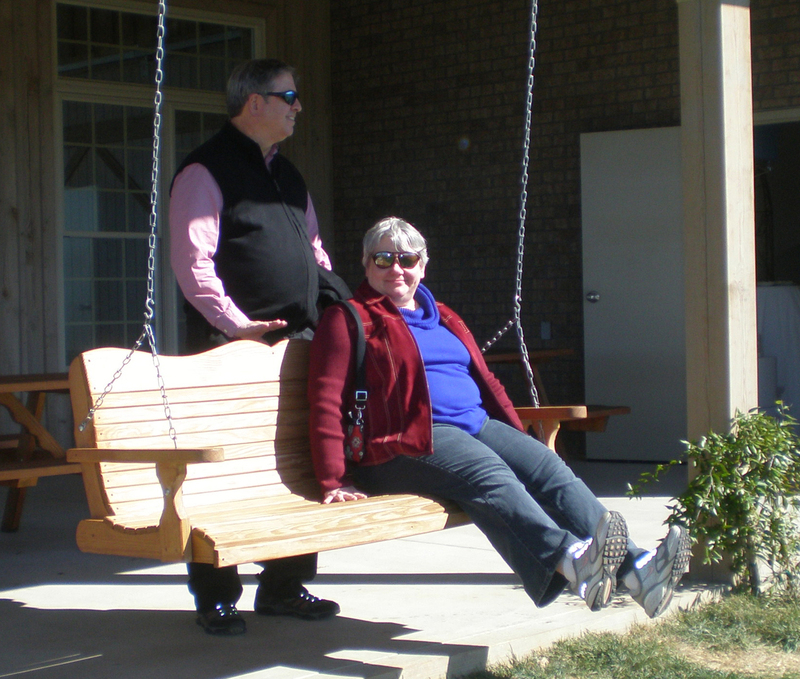 But she and I, have the mindset of enjoying using those pieces in our every day lives, if you love it, use it! I use one of our wedding china tea cups whenever I drink hot tea, not just because it’s a special day. Reinforcing my dress code thought process, I also try to keep my nails looking nice. I’m completely embarrassed if there’s a chip in my nail polish… and when the polish is mostly gone and chipped away, I can hardly look at my fingers. So I’m constantly cleaning, cutting, or painting my nails. And sometimes a nail break is needed during the day, and I don’t mean broken nail, I mean a break to spiff up my nails. If slapping on a quick coat of paint makes me excited to get to work, I’ll do it. So, I keep my manicure goodies in this gorgeous bowl because, why not? It’s fun for me to look at and it reminds me of Sara every time I see it. I love it! That about sums it up… By doing these small things every day I am proud of my little business. It’s important to me and feeling confident, knowing my agenda, keeping my eye on the big picture, staying organized and loving my work space make me a happy worker. But until then, happy work anniversary to me!!! I can’t wait to see where I’m at in four more years! I have issues… with garden flags. [A little back story] Since Surtex is holy crap NEXT WEEK I have been going back through and refining presentations and collections. Back in February, I allotted time to work on a garden flag presentation and let’s just say… it was a nightmare struggle. I just cannot seem to wrap my brain around those things… I haven’t bought them for myself, so not really knowing what’s out there was an issue to start off with. But then, they seem so Mom-ish… and I am not a Mom… nor do I have a house to be Mom-ish in. So it seemed as though I was just not on the same level with the buyers of said garden flags, which resulted in a major disconnect when trying to design them for a presentation. Luckily, I was smart and made time for these kinds of major disasters fixes. I truly believe that sometimes you just need to put something down for a while and come back to it. In this case, I needed to put it down for 3 months… And once I came back to it, I cried realized these designs were not in a good place. So I’m working on “fixing” them, aka completely redesigning them. I thought you’d get a kick out of seeing the difference… I hope you don’t think less of me after seeing the first attempt. I know I do. Today marks the 1 year anniversary of the day my heart broke to pieces, my world took a devastating hit, and my love for my family grew 100 times. My Mom unexpectedly died January 5, 2012 of heart failure. A little back story… The beginning of 2012, was very rough for me. I had just made a major change in my life, December 2011 my ex and I amicably called it quits after 4 years and I moved into a friend’s house (Liz and Jonathan Melville). I wound up going to Greenville for 2 weeks and spending Christmas with my parents, and healing my heart. My Mom and I decorated the tree and she told me where each ornament came from and what it meant to her, she cooked and taught me how to make the famous secret family noodles recipe, we discussed my decision to move on with my life, we laughed and spent lots of time together. On Christmas Eve she went above and beyond to create a fantastic meal, and to our surprise, she decided this year she would make a HUGE Christmas morning spread, unparalleled in our lifetime of Christmas mornings. The whole family was together and it’s exactly what she wanted… plus she held Isabel most of the time. I headed back to Atlanta and spent New Years with friends, while she and my Dad celebrated at Kristin and Jonathon’s house. Only 4 days after New Years celebrations had ended my Dad called me at 1:24pm and with a weak voice said “your mom has died.” I stood up from my chair and I literally did not understand the words he had just said. Once he repeated those words, I fell to my knees and could not contain my tears. After he told me the gist of what happened that afternoon, only one hour prior to this phone call she was alive… and like that, she was gone. Ripped from my world. I called Liz first, and as soon as she answered, my voice was flooded with tears and I had to scream what happened in order for me to get the words out. Without hesitation she was on her way home to be with me. I called my other best friend Amy, which Liz had already made a quick call to, and screamed again. Amy comforted me by phone until Liz showed up and found me curled up on the floor crying. My world felt like it was over. I will not ever forget this day. I still have a heavy heart, and I continue to be emotional, even as I write this. The rest of 2012 was difficult, but there were definite bright spots, like that I believe my Mom brought me to the man of my dreams. While still grieving from January, I began dating Ryan in April. Three days after we met, we were “officially” dating. Two weeks later, he had his own personal family tragedy, his father passed away from a battle with lung cancer. Though I was still dealing with my own issues getting through my Mom’s death, I was suddenly and for the first time ever, prepared to help someone else through their own emotional roller coaster. Suffice it to say, it brought us very close and created a connection between us that is unbreakable. We both understand how fragile life is, and because of that we do not take advantage of our time together. I am so thankful that Ryan was brought into my life, and I think my Mom had a hand in it. But since this is her anniversary, I want to celebrate her and acknowledge a day that changed my life. I plan on releasing two white balloons at 12:30 this afternoon, the approximate time she died, one for the memories of the life that I lived with her in it, and the other for the life I will live with her from above. Take a moment today and hug your loved ones that are close, and for the ones farther away give them a call and tell them you love them. As I head out for my day, I’d like to share a poem I saved especially for today. I’m still here, even though you don’t see. I am everything you feel, see and hear. I’m the warm sand when your at the beach. The clear cool water in a quiet, still pond. You can talk to me through the sky above you. Just look for me, my loves, I am every place. CardGnome.com (where I have 47 greeting cards) is so wonderfully participating in sending troops over seas some 10,000 holiday cards! 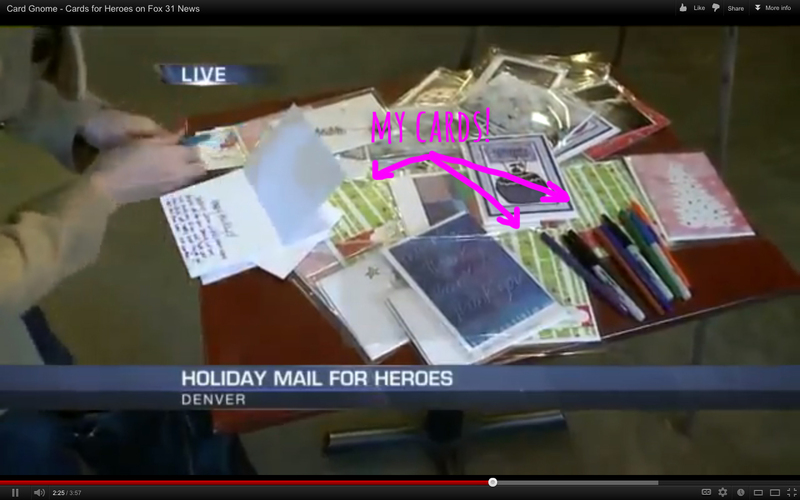 They were doing a promotional event to get those cards movin’ in a coffee shop in Denver, Colorado on Monday and some of MY CARDS made it into the mix they chose to send! 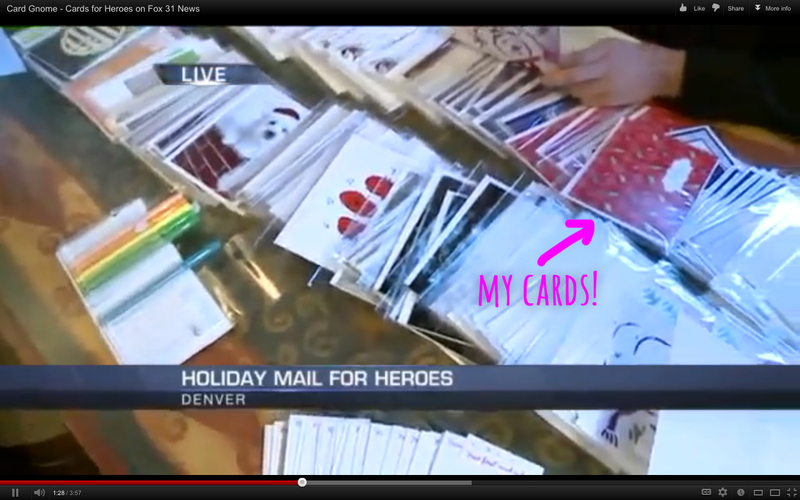 The local news covered the event and you can see my cards! I was so excited, I just had to share! 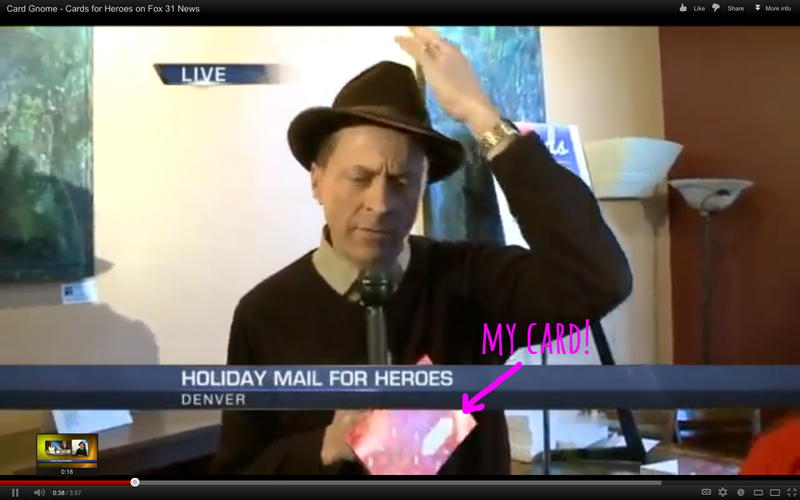 Enjoy the video and play “I SPY” on my two holiday greeting cards! You too can send a free card just by going to CardGnome.com! Do it, it’s free, seriously there’s no reason not to! A little back story, with a painted ending. When you’re in school for art, or in my case, Illustration, you are drawing, painting, photographing, sculpting, etc every. single. day. It’s awesome when you look at what other people have to do every day… but it’s creatively exhausting at the same time. Luckily, you get really good at all of those creative outlets because you’re having to work on them every week. 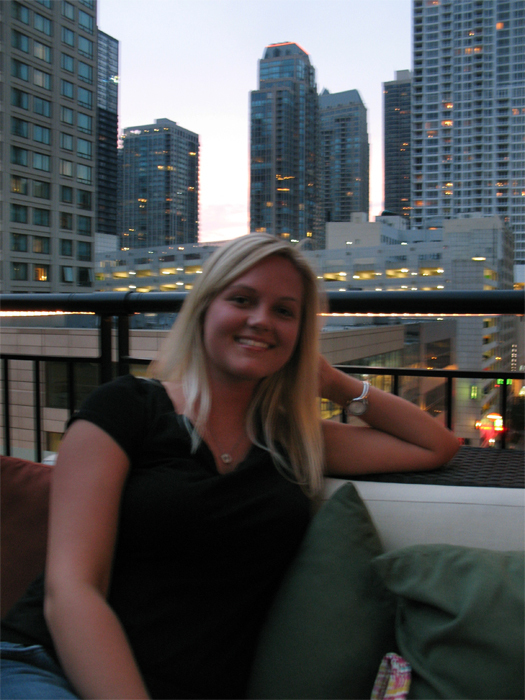 Once I got out of school I worked for an advertising agency (yay for getting a job so quickly)! BUT, because I was designing everyday, I was no longer being creative and drawing, painting, photographing, etc, and I literally forgot how to draw. A while ago (3ish years), I took a drawing course at night at Emory so that I could introduce myself to drawing again. I had felt so lost not drawing everyday and actually loosing the ability to draw terrified me. I identify myself as an artist and I felt like I couldn’t even begin a drawing. It was not what I wanted with my life. Eventually I wound up getting a job at a napkin company out of desperation as a secretary… 2 weeks into that job I was doing design work again and not really being a secretary any longer. Approximately one to three months later, I was promoted to Art Director because I was solely doing design work again. At some point the company decided to design “everyday” napkins and I had come up with cool designs that I liked but then I had to draw them! Yikes! BUT, I started drawing again… and it got easier and easier… and I did less and less erasing and starting over. I really LOVED drawing again and I was getting good at it all over again! The end of that story is when I noticed my personally designed napkins were some of the best selling products in the entire company, the company somehow decided they didn’t need me and let me go (HAH!) and I decided to take a leap and push myself into licensing. That was a little over 2.5 years ago! Now that I’m in licensing, I draw EVERY day!!! I absolutely love it. 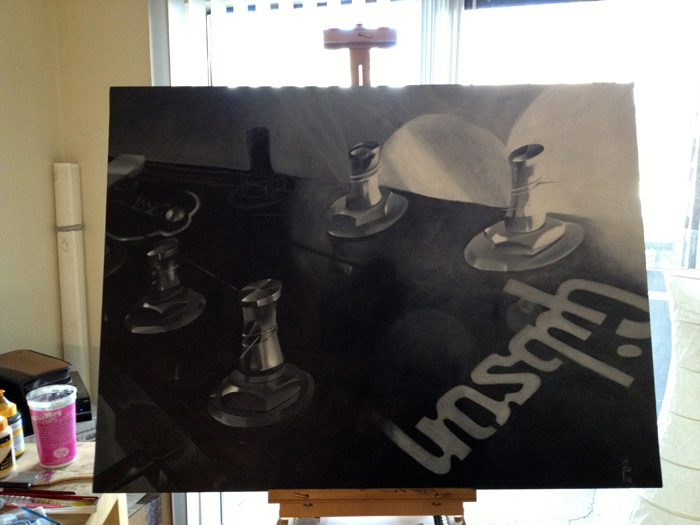 But I rarely get a chance to do some of that other stuff like photography, sculpture and **gasp** painting. Of course… I’ve kind of lost my touch on those too… but not as horribly as I had before. 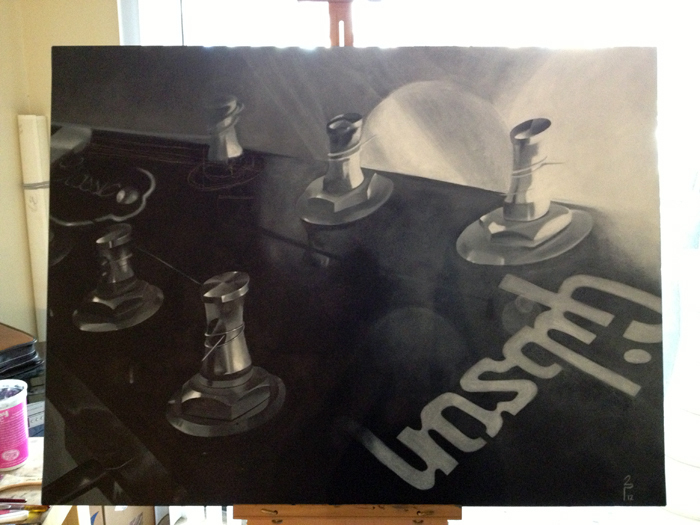 So when the opportunity was presented to do a commissioned painting, I hesitantly accepted. It was for one of my best friend’s and she was going to give it to her husband for his birthday… Pressure from the get-go to make it look great. She wanted to give him a painting of something he cherished possibly more than her his Gibson guitar, but she didn’t just want a picture of a guitar because they had a couple of those already. She wanted something unique and different. 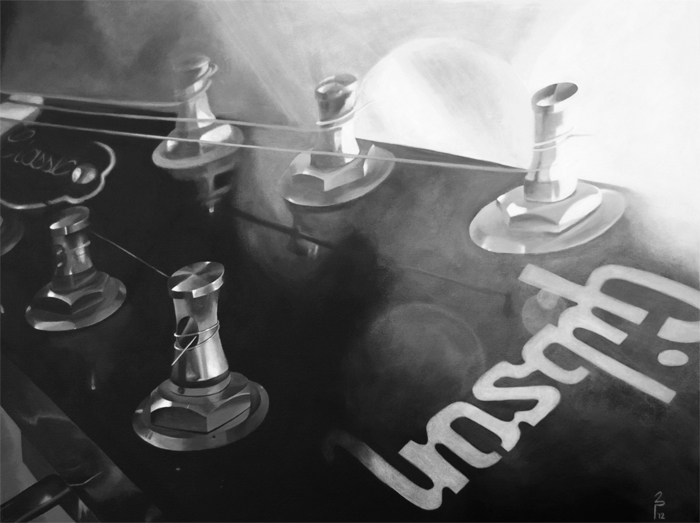 I’ve NEVER painted a guitar… or even attempted to draw one… how in the world do you make a guitar different and unique? After doing some looking around I figured out what I wanted to do… and I warned my friend that this would be a learning experience for me since I hadn’t painted in 4-5 years a while. 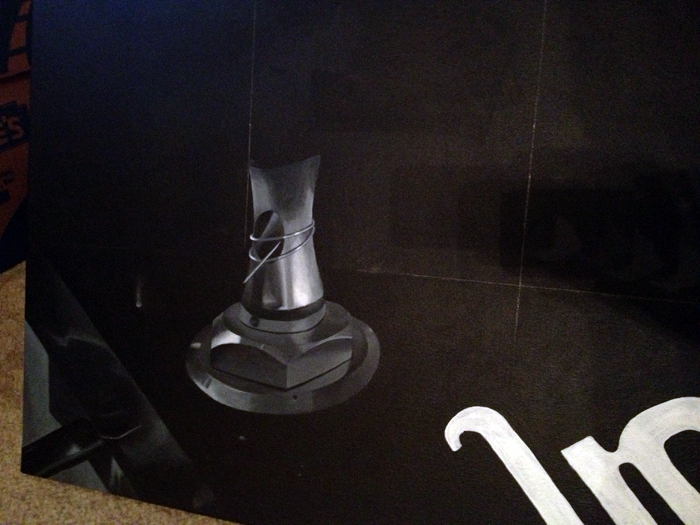 So we snuck some pictures of his guitar, obviously I needed reference, and I composed the image I wanted to paint. 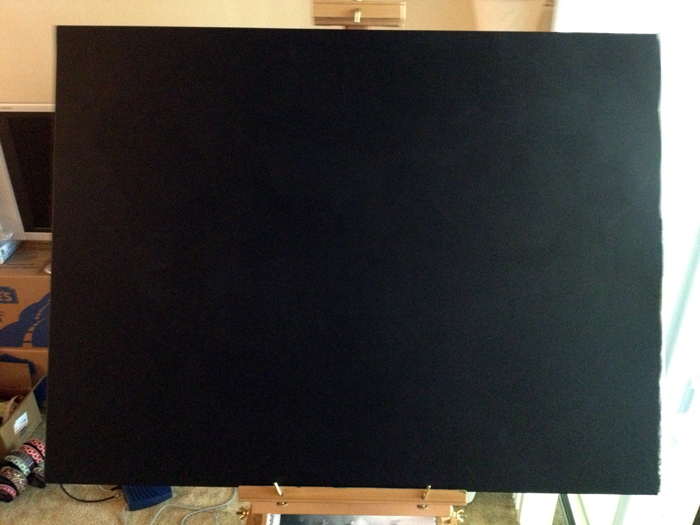 Then I decided to go big, I bought the 30×40 canvas and started out by painting it black. Have you ever attempted to do a drawing on a completely white sheet of paper? It’s nearly impossible. Where do you start??? A trick, shade the paper with your pencil or, in my case, paint the canvas black. It’s MUCH easier to find a place to start. Trust me, it works. Anyhow, I began by putting grid lines on the canvas and the printed picture of the guitar which helped me estimate exactly where everything went on the canvas. 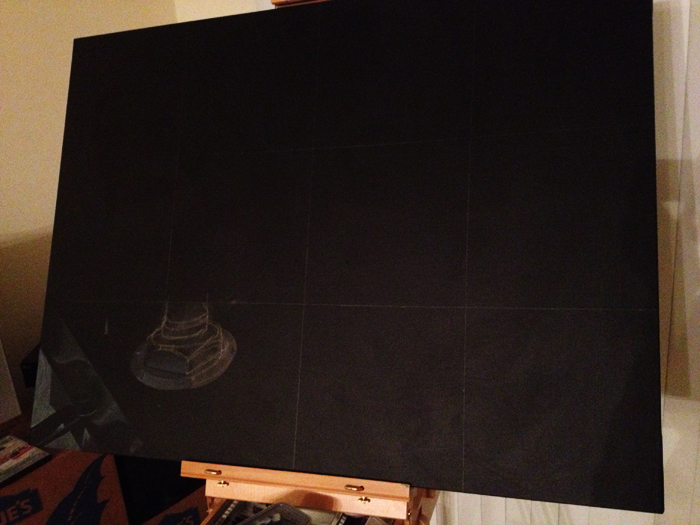 And off I went… slowly starting to paint here and there until shapes started to form… I’m not ashamed to say, I started over one or two times in certain areas. 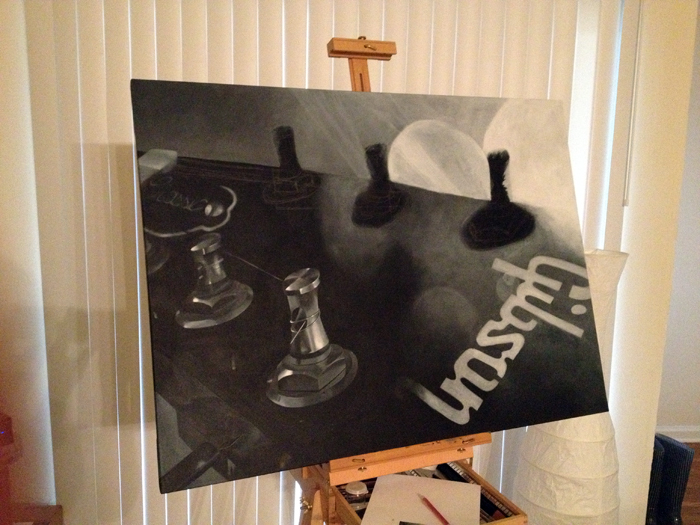 I’ve included some in progress shots of the painting that I sent to my friend so she knew what was happening. It was right after this photo, that I was on the verge of giving up because I was struggling on the “Gibson” letters and I’d hit a wall on how to do this… and luckily I painted over them, and started over. And here’s the final image…. It’s safe to say he loved the painting even though I was terrified nervous because it was my first painting in years. 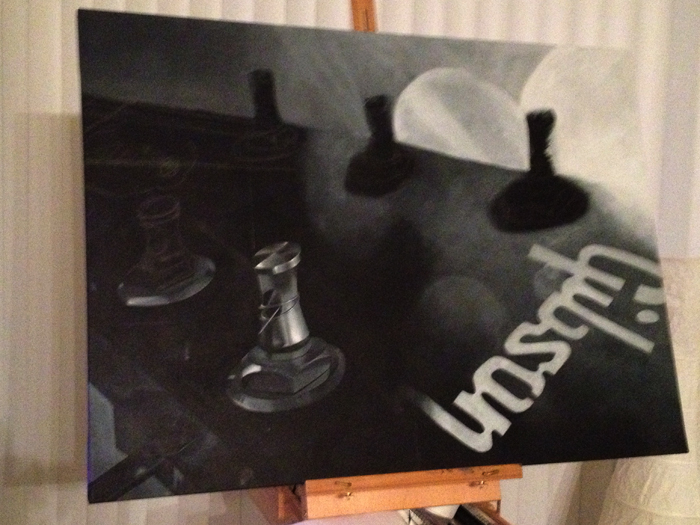 After this I was creatively exhausted… it may be a while til’ I do another painting, but I’m glad I did it. I impressed myself! Happy Birthday man! I hope you enjoy this forever and ever!!! This afternoon I got a reminder email to send Halloween cards to my friends and family using CardGnome.com, how nice of them. When I scrolled down the email I was excited to see my “feelin’ witchy” card featured as a suggestion!! 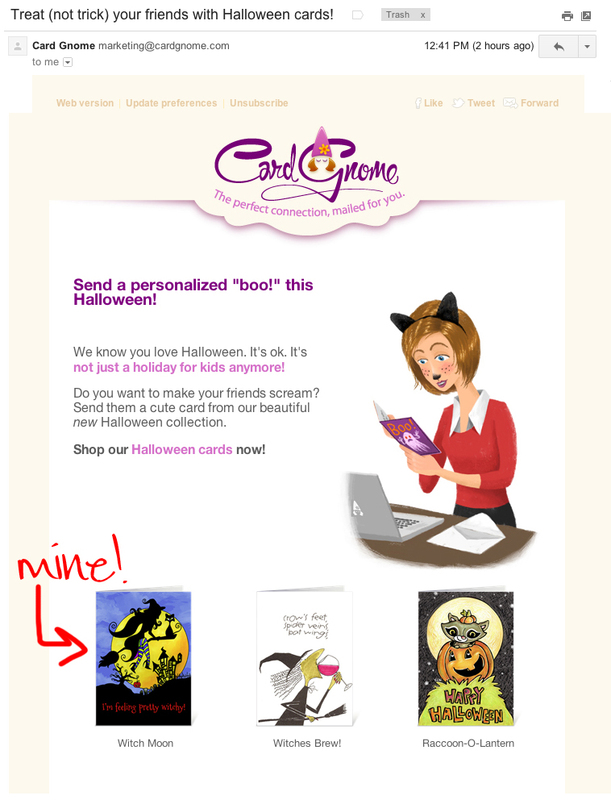 Which reminds me… Go to CardGnome.com and look at my super cute Halloween cards to send to your friends and family!! Ooooooooh!! Looky looky, when I went online to get the link…. Yay!!! Is there ever a “slow season” with licensing? I feel like I keep telling people it’s my busy season… but it never officially slows down. I’ll admit, there are a lot some days that creativeness just ain’t happening and I can tell from the moment I get out of bed. There’ll be a HUGE to-do list waiting for me and I just cannot focus… so instead I get groceries, spend hours on Pintrest, see who has repinned my pins, look at clothes online, decide what I want my “look” to be this winter, figure out how I should decorate my future house, decide I need new boots and where I can get them for a good price, ya know… generally avoid doing anything really productive. My friend asked me why my nails were painted dark blue, my response was “cause I like the color duh” but in the midst of discussing our favorite colors, I had an epiphany. It’s very simple. I use nail polish to alter my mood. But really… I figured out that when I need to develop, color or create a design I am unknowingly using nail polish to get my creative juices flowing. 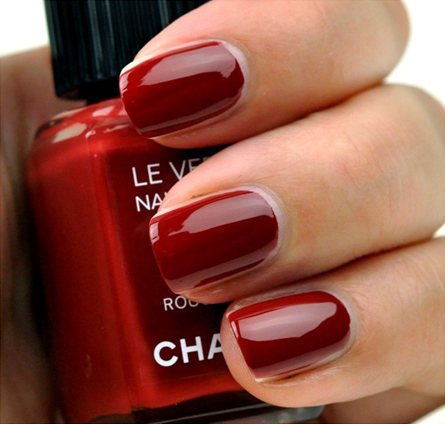 I think it’s actually kind of interesting… have you ever thought that changing your nail color can change your mind set? I usually just think I need something pretty on my nails… but to realize that it affects my way of thinking is kind of crazy. But it works. 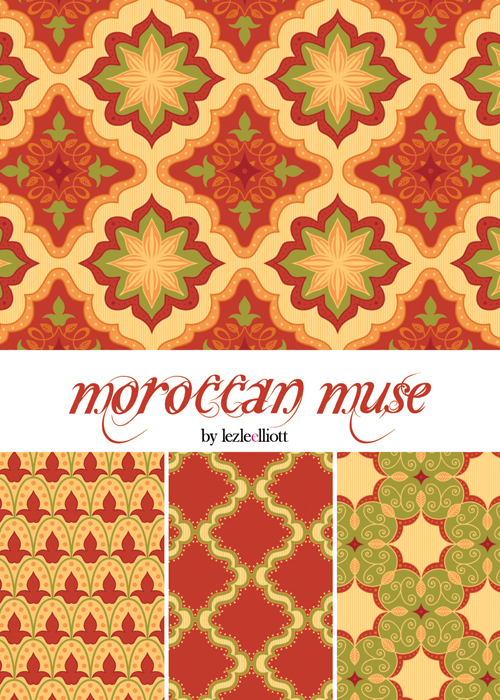 I decided I wanted to create home decor and kitchen items with my Moroccan Muse pattern, so I wanted to change the color palette to something more appropriate (if you saw it before it was gold, pink, brown, purple, etc… not really “let me decorate my kitchen with this” type colors). I grew my nails a little longer and painted them red, which in turn made me get into a sophisticated, decorate-my-home, my-husband-will-love-this mode. I felt older, sophisticated, like I have a big house, the time & money to get manicures, and it reminds me of my Mom (her nails were always red). I also think of 50’s housewife ads, I think they always had red nails… so maybe that has something to do with it. Regardless, here’s some work that came from me having red nails…. 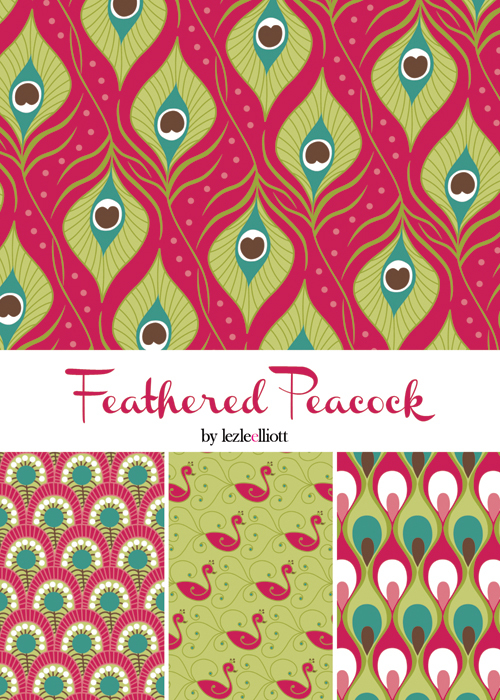 I did something similar for recoloring my Feathered Peacock patterns. I wanted to feel young, careless, summery, like I was in my late teens early 20’s… so I chose coral and cut my nails to about mid length. And lastly… I was working on my NEW Haute Wine girls, they’re amazing by the way, and I needed to feel confident, fashiony, sure of myself, defined, artsy and basically like a total badass… so I went with short dark blue nails! I think black is overdone, so I go with dark blue. They almost look black but then it’s like a surprise when they catch the light and you realize it’s blue… It’s pretty awesome. I’m telling you, it works. Try it. NOW! I’m almost out of nail polish remover and now I’m obsessed with finding new nail polish colors to try… Any suggestions? Well well well… I do exist. It has been a busy last couple of months, I mean I can’t even tell you what all I’ve worked on. No really. I can’t tell you. But I’ve had quite a few exciting things happening over here and I can finally tell you about one of them! The other one is like supercalafragalisticexpyaladocious exciting… and I’ll just say this. Next spring/summer, you’re whole kitchen/picnic can be filled with lezleelliott products!!!!!!!!!!!!!!!! Ok, now, the news I CAN tell you! 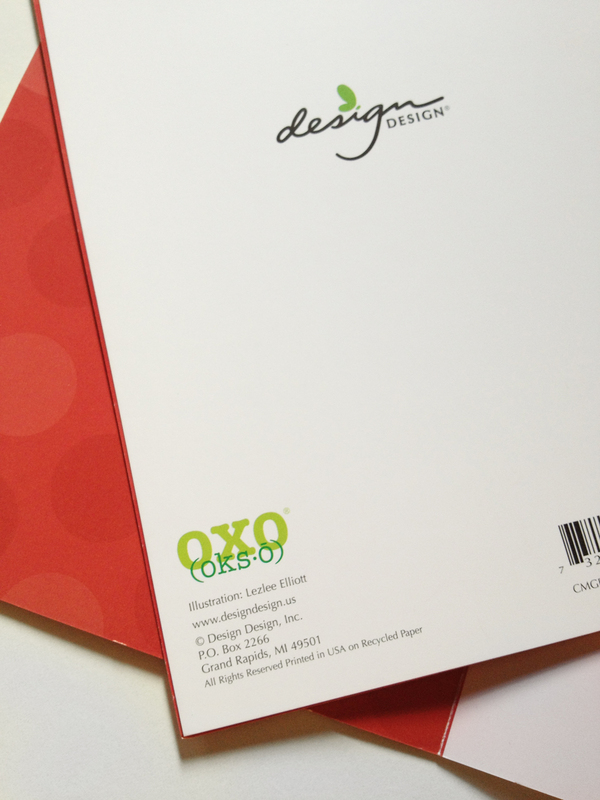 Greeting cards!!! 46 of them to be exact. That’s right 46 lezleelliott greeting cards are NOW AVAILABLE to you online at CardGnome.com! Let me first explain where/how this whole awesome website works. 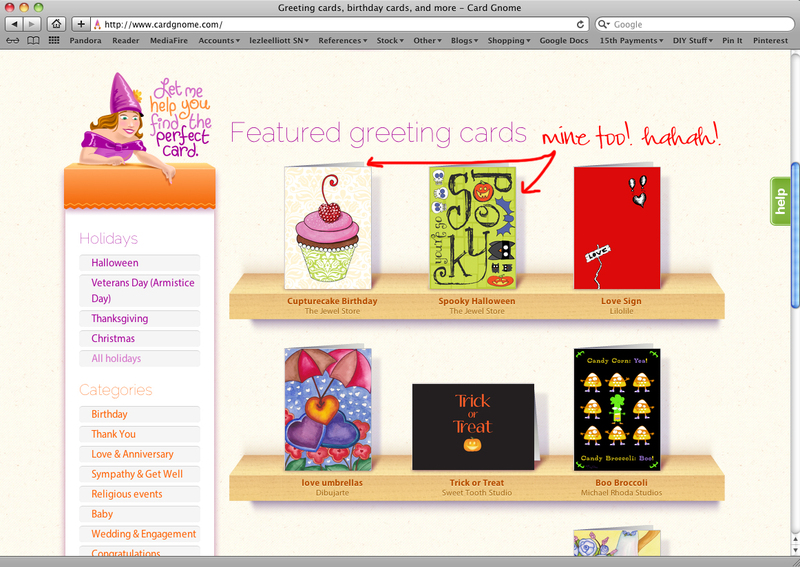 Card Gnome provides an online shopping center with tons of cards. Once you purchase a card, you can either 1. personalize it right there on the computer and have it sent to your recipient, OR 2. you can send it to your house and write your message and send it off (with the extra included envelope) yourself! Here’s the best part. You can sign up for a “Card Plan,” which allows you to purchase all the cards you need for the year and have them sent out on dates you choose! So literally you can pick every birthday card you need, choose when it should be sent, fill in the message and BOOM, not worry about it for the rest of the year. AND postage is included in the price of the card! 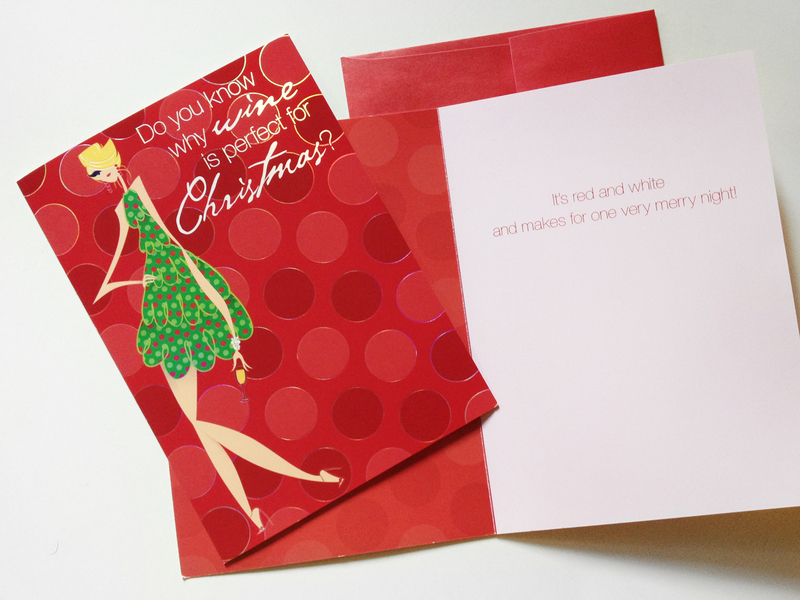 You can also purchase the cards in bulk, like Christmas cards. Cause duh, mine are the cutest. Here’s the kicker, Card Gnome has categorized the cards into “The Jewel Store” because other fantastic artists from my agent are also in there like Simon & Kabuki, Robin Pickens, Darcel Phillips, PhiloSophie’s and Heather Rosas. But I have all kinds of cards in there for Birthday, Baby, Cocktail, Halloween and Christmas! There are currently 36 of them up… so I’m working to get the last 10 on there, my Haute Wine Girls!! Everything else is from my Too Sweet candy/cake/cupcake collection, Cocktail hour (Martini/Margarita/Wine) collection, Baby Animals (elephant/giraffe/lion) collection, Haunted Halloween collection, and Winter Woods (birds in trees and circles) collection. So go check out all the cards, and buy some!!! So I know it’s been about two months since I last wrote… I’ve been busy lay off! I moved, again. Third time this year. Blah. I’m finally settled, but also had to finish up all my presentations for Surtex. Madness all in itself. And NOW because my presentations were tha bomb really good, manufacturers are requesting files and I’m busy making sure they get everything they need! But in the midst of all that, some samples have arrived! Which means that products should be shipping out to stores and they’ll be prepping to put them on the shelves! Yay! I’m gonna show you all the samples I just got, BUT I need your help… if you spot these items out in stores you MUST TELL ME WHERE!!! I don’t know where these items will be, I just know they’ll be out, so I’m dying to know if you see them! 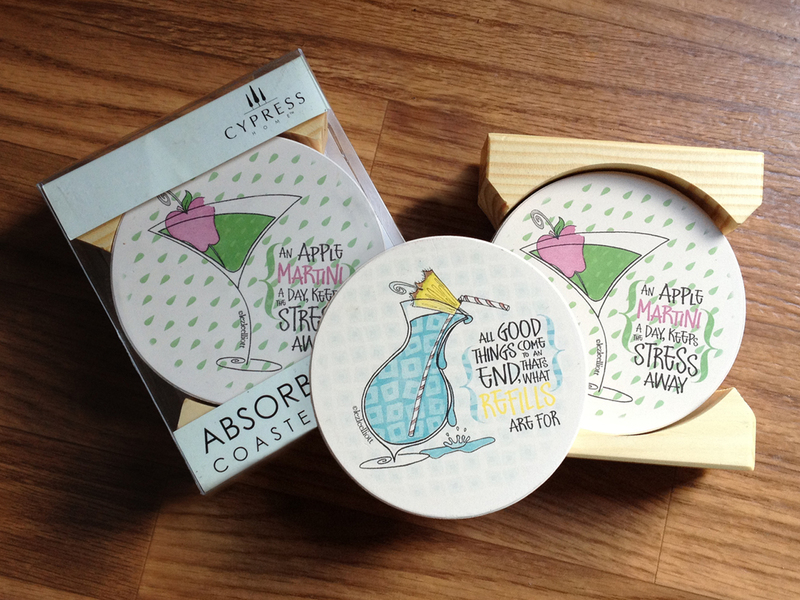 Anyway, out this summer are these fantastic coasters! 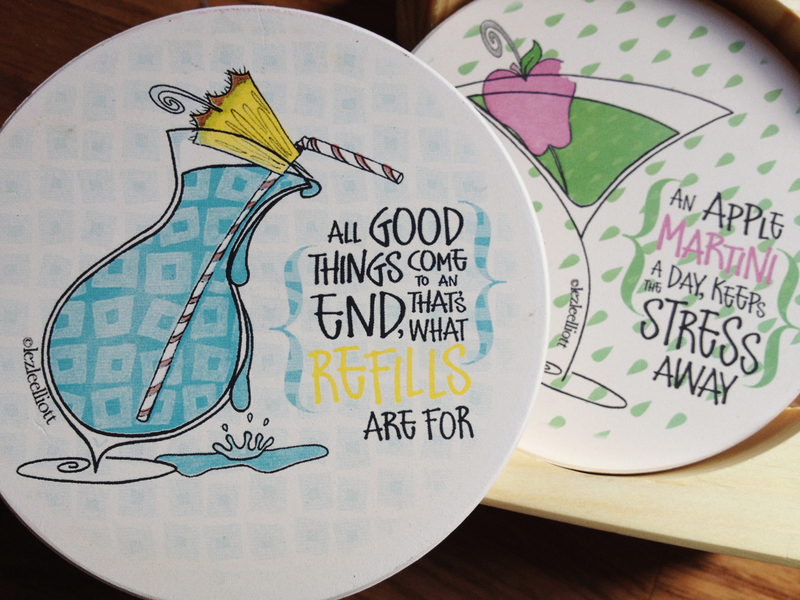 Two designs and a wooden holder, they’re perfect for summer time drinks. 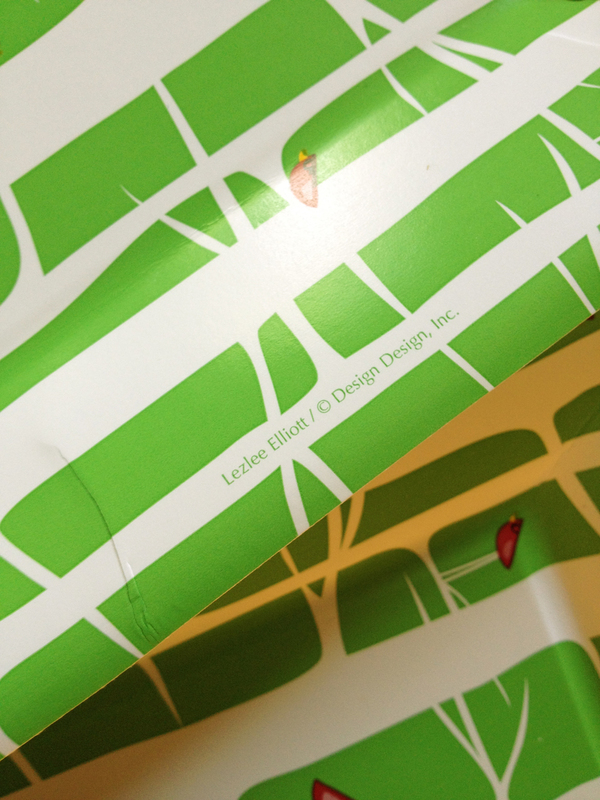 They LOVE me over at Design Design, cause they have LOTS coming out this Christmas! 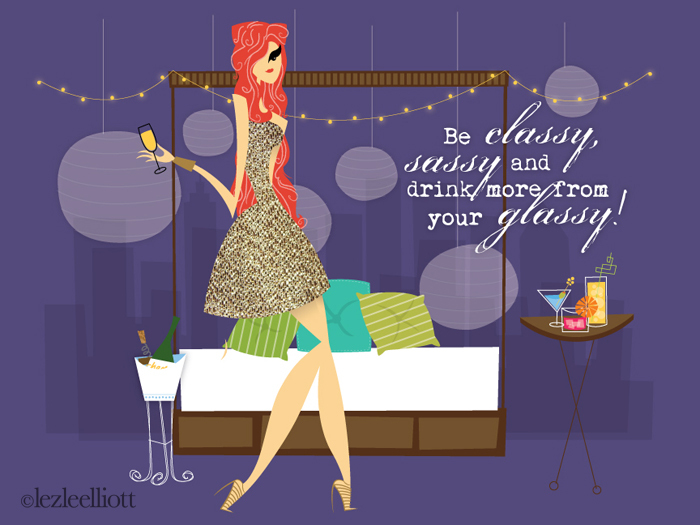 A greeting card featuring one of my Haute Wine girls!!!!!!!!! 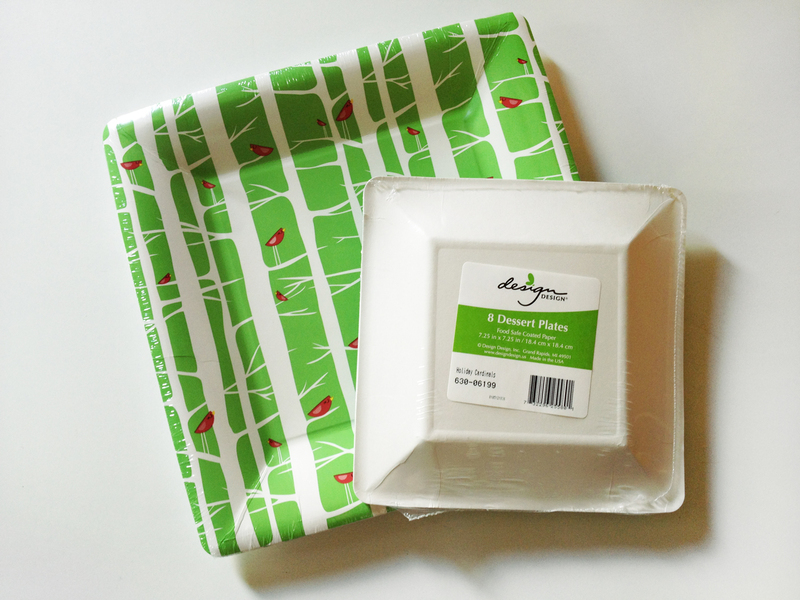 !, wrapping paper, gift tags, dinner plates, dessert plates, beverage napkins, guest towels (buffet napkins), and lunch napkins! Looking forward to seeing pictures of Christmas celebration tables decorated with these. The card is fantastic, her dress and the circles and the text are foil stamped so the shine in the light! It looks soooooo great!!! 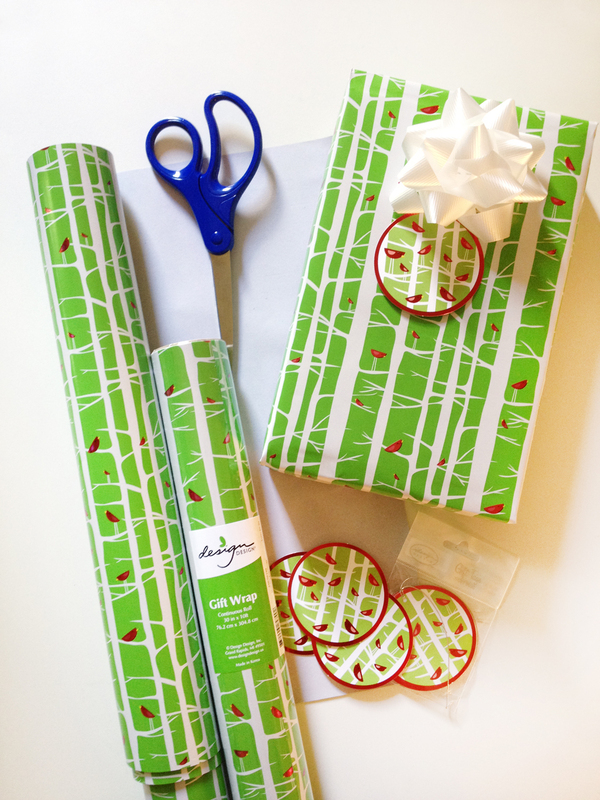 The wrapping paper and gift tags also have foil stamped birds on it, so they shine! So did I make up for the two months I’ve been gone?? I think these will look great this winter!